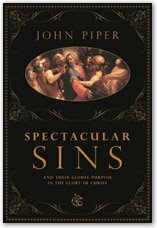 If you want to read a book that will help you appreciate and delight in the sovereignty of God over everything (and especially if you don’t), including the myriad evil in this world, I suggest you read one of John Piper’s most recent books, Spectacular Sins and their Global Purpose in the Glory of Christ. Don’t let the title daunt you. It is not a difficult read. In fact, I had it done in about 4 days. And all the time spent reading it was worth it. Rarely have I seen more clearly the glory of Christ in the worst of circumstances and the purpose of God in the most senseless of activities. I thank God for this book and I thank John Piper for accepting God’s call to write it. I recommend it to you with no reservations. Please consider taking a weekend to read this book. I promise you won’t be disappointed. If you don’t know who Albert Mohler is, you should. Dr. Mohler is one of my many heroes in the faith; an author, preacher and president of Southern Theological Seminary in Louisville, Kentucky. He is wise and intelligent, a rare combination these days and he graciously shares his insights without condenscension. His program, “The Albert Mohler Program” is an hour-long radio broadcast, Monday through Friday, from 5 to 6 p.m. that is carried by radio stations across the country. You can also listen online be found on iTunes as a podcast. Each week, he addresses issues ranging from theology to politics to science to you name it. And on every Wednesday, Dr. Mohler opens his show to any kind of question that his listeners will throw at him. He always responds without hesitation and is never above admitting that he may not know something. All in all, Dr. Mohler always has something interesting to say and he excels at his aim, to encourage “intelligent, Christian thinking”. So, if you haven’t heard Albert Mohler, I would urge you to listen to him. A Helpful View of Christmas. “Bah! Humbug!” These two words are instantly associated with Charles Dickens’ immortal fictional anti-hero, Ebenezer Scrooge. Scrooge was the prototype of the Grinch who stole Christmas, the paradigm of all men cynical. We all recognize that Ebenezer Scrooge was a mean person – stingy, insensitive, selfish, and unkind. What we often miss in our understanding of his character is that he was preeminently profane. “Bah! Humbug!” was his Victorian use of profanity.